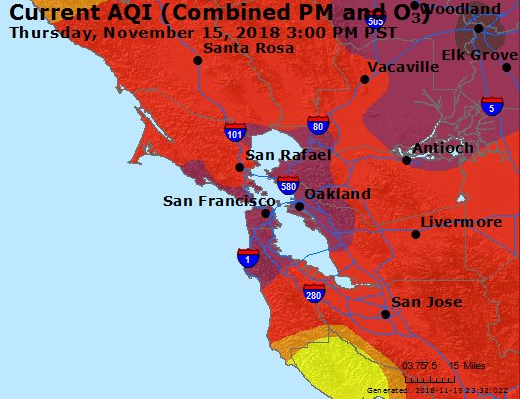 Air quality in the region has worsened due to heavy smoke from the Camp Fire in Butte County. Thursday afternoon, EPA’s Air Quality Index rose to the “very unhealthy” range. People with heart or lung disease, older adults, and children should avoid all physical activity outdoors. Everyone else should avoid prolonged or heavy exertion. All recreation programs and centers will also be closed to the public. We regret the difficulty and inconvenience this may cause some families as we all grapple with extraordinary circumstances and take precautions to keep our community safe. Libraries, senior centers, and City offices will remain open normal hours. The City will continue to monitor air quality conditions and provide updates. Visit Airnow.gov for latest air quality information by ZIP code. The Air District has extended the Winter Spare the Air Alert through Tuesday, November 20th. Learn more details and safety guidance from the Alameda County Public Health Department. Stay indoors or limiting time spent outdoors, particularly for people with lung or heart conditions, who are at higher risk. Vulnerable populations should avoid all physical activity outdoors. Keep windows and doors closed until smoke levels subside. Set air conditioning units and car vent systems to re-circulate to prevent outside air from moving inside. Sign up for a local emergency alert via text, phone, and email at AC Alert.